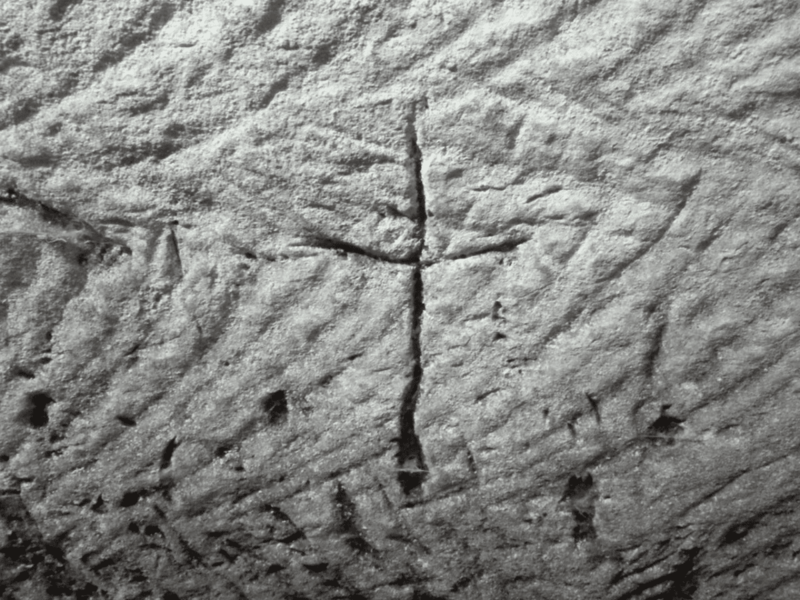 A rare and intriguing discovery was revealed this weekend by hikers exploring a water cistern in the Judean Shephelah: on the walls of the cistern, which is hewn in Menorah and a Cross chalk bedrock, were incised ancient engravings of a seven-branched menorah and a cross. Last weekend touring enthusiasts Mickey Barkal, Sefi Givoni and Ido Meroz, who are members of the Israel Caving Club, went out to visit hidden caves in the Judean Shephelah. According to hiker Ido Meroz, “We heard there are interesting caves in the region. We began to peer into them, and that’s how we came to this cave, which is extremely impressive with rock-carved niches and engravings on the wall. Just before we were about to return we suddenly noticed an engraving that at first glance seemed to be a menorah. When we realized this is an ancient depiction of a menorah, we became very excited. Its appearance was quite distinct. We left the cave and reported the discovery to the Israel Antiquities Authority”. The menorah engraved on the wall of the cave has a base with three feet, and it evidently portrays the menorah that stood in the Temple during the Second Temple period. A cross was engraved near the menorah. Another engraving was found on the side of the cave which seems to resemble a type of key that is characteristic of antiquity, as well as other engravings that were noted, some of which have not yet been identified. Alongside the cistern is a columbarium with dozens of niches that were used to raise doves in antiquity. During the Second Temple period doves were used as part of the sacrificial rites in the Temple. According to Sa’ar Ganor, the District Archaeologist of Ashkelon in the Israel Antiquities Authority, “There are buildings and hiding refuges from the time of the Bar Kokhba uprising (second century CE) at the site and buildings that date to the Byzantine period. It is rare to find a wall engraving of a menorah, and this exciting discovery, which was symbolically revealed during the Hanukkah holiday, substantiates the scientific research regarding the Jewish nature of the settlement during the Second Temple period”. Ganor added, “The menorah was probably etched in the cistern after the water installation was hewn in the bedrock – maybe by inhabitants of the Jewish settlement that was situated there during the Second Temple period and the time of Bar Kokhba – and the cross was etched later on during the Byzantine period, most likely in the fourth century CE. The menorah is a distinctly Jewish symbol of the Second Temple period. To date, only two engravings of menorahs are known in the region of the Judean Shephelah: one on oil press at Bet Loya where the same style menorah is depicted, and the other in a burial complex in the vicinity of Bet Guvrin. Other menorahs are portrayed on clay lamps from Beit Natif. In light of this interesting discovery, which adds another important tier to the archaeological information and knowledge about the region, the Israel Antiquities Authority will continue to study the site, whose exact location was not given in order to protect it and the safety of hikers. The hikers who discovered the engravings will receive a good citizenship certificate and will be invited to participate in the coming archaeological surveys that the Israel Antiquities Authority will conduct in the Judean Shephelah.